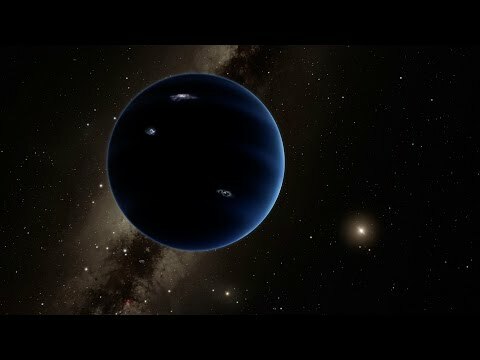 The six most distant known objects in the solar system with orbits exclusively beyond Neptune (magenta) all mysteriously line up in a single direction. Also, when viewed in three dimensions, they tilt nearly identically away from the plane of the solar system. 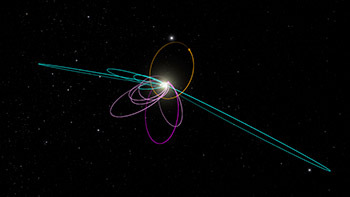 Batygin and Brown show that a planet with 10 times the mass of the earth in a distant eccentric orbit anti-aligned with the other six objects (orange) is required to maintain this configuration. Caltech professor Mike Brown and assistant professor Konstanin Batygin have been working together to investigate distant objects in our solar system for more than a year and a half. The two bring very different perspectives to the work: Brown is an observer, used to looking at the sky to try and anchor everything in the reality of what can be seen; Batygin is a theorist who considers how things might work from a physics standpoint.